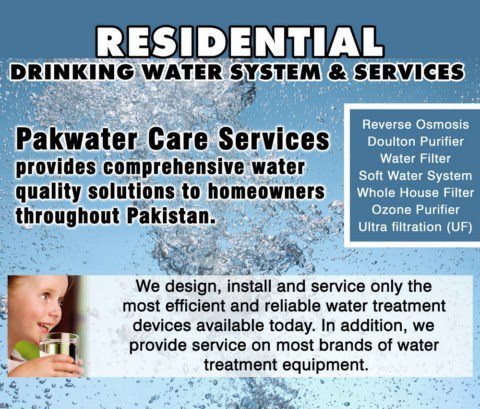 Pakwater Care Services provides comprehensive water quality solutions to homeowners throughout Pakistan. We design, install and service only the most efficient and reliable water treatment devices available today. In addition, we provide service on most brands of water treatment equipment. In order to properly configure a water treatment device there are three critical pieces of information needed. A comprehensive water analysis reveals what we are dealing with and pinpoints the areas of concern. Although we perform water testing, water treatment companies do not have the elaborate and accurate testing equipment such as a Mass Spec. Water testing labs have the equipment to perform water analysis with a high degree of accuracy. Water testing should include those items regulated by the State or as listed in the standards promulgated by the EPA. The flow rate tells us how much water is being used. This item is something we determine based on home size, number of residents and number of water using devices in the home. Flow rate is critical in determining the size of the water treatment equipment. Our approach has always been to thoroughly explain any problems that may exist with the customers’ water, what solutions are available and how they work. Pakwater Care Services has both a residential service team and a commercial/industrial service team. So whether your system is reverse osmosis, a water softener, a large water filter or an ultraviolet system, you can have faith in our certified service technicians who have years of experience with all makes and models. We will have a great deal of experience and knowledge with water systems. We will do a thorough job, paying strict attention to system sanitation. We will leave everything looking as good or better than when we arrived. We will charge a very reasonable rate. The whole experience will be easy. Give us a call and arrange to have your water system professionally serviced. Our rates are reasonable and our service technicians are top notch.